State weather bureau, PAGASA reported as of 11 AM today, that Tropical Depression Seniang has intensified into a Tropical Storm and has made a landfall over Surigao del Sur. 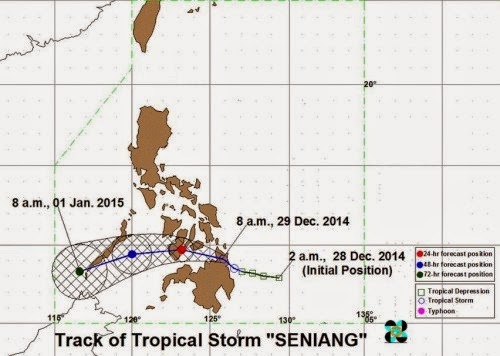 Tropical Storm Seniang has maintained its strength and now moving towards Agusan del Sur. PAGASA said that "the center of Tropical Storm “SENIANG” was estimated based on all available data including Hinatuan and Cebu Doppler radars at 33 km Northeast of Butuan City or 30 km East of Cabadbaran City (9.1°N, 125.8°E)." Tropical Storm Seniang has maximum sustained winds of 65 kph near the center and gustiness of up to 80 kph, Tropical Storm was forecast to move West Northwest at 11 kph. Local weather bureau advised residents in low lying and mountainous areas are alerted against possible flashfloods and landslides. The public may expect the next weather advisory at 5 PM today. Comments or suggestions about "PAGASA: Bagyong Seniang Update for Dec. 29, Monday" is important to us, you may share it by using the comment box below.